By stainless steels we mean steels resistant to corrosion and having a broad range of mechanical and physical properties linked to their chemical composition. According to EN 10088-1 norms, stainless steels are steels containing at least 10.5 % chromium and maximum 1% carbon. 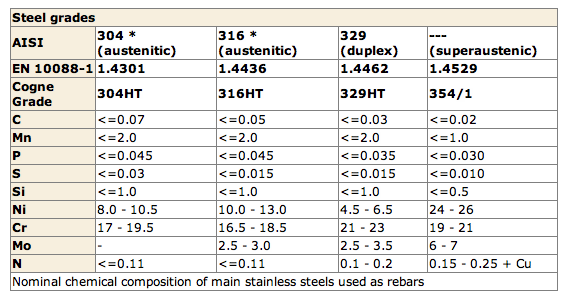 For stainless steels used to reinforce concrete the maximum carbon content allowed is 0.07 %: their high resistance to corrosion stems from the formation of a thin and colourless oxide film (mainly Cr 203) bonded to the steel surface and that makes the material virtually inert to the surrounding aggressive environment. To the iron -carbon alloy (standard steel) , apart from Chromium, other elements such as nickel, molybdenum and titanium are sometimes added. Such elements greatly influence the microstructure, the mechanical properties and the corrosion resistance. Corrosion resistance in particular is increased through carbon content reduction and an increase in the other elements added to the alloy. The first two categories ( austenitic and austenitic – ferritic) are of particular interest for the production of stainless steel rebars. Those categories are often classified according to AISI American norms (American Iron and Steel Institute), Euronorm commercial grades are now commonly used. Cogne Specialty Steel USA, Inc.